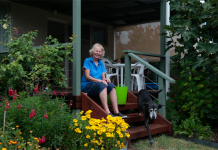 IT’S all about relaxed, laid-back living for garden owners Alan and Lynne Wade, whose Kambah home features wide decks to the front and back for entertaining while enjoying the garden and views over the Brindabellas. The garden keeps them busy though, with a broad sweep of natives to the front and veggies, berries, beehives and chooks tucked away in the back behind thriving hydrangeas and callistemon. 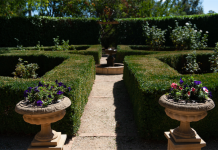 The garden will be open to the public for the first time through Open Gardens Canberra on the weekend of November 24-25. Meandering paths take visitors to hidden nooks and crannies in what Alan describes as a “largely unstructured garden full of surprises” on their steep 1800sqm block. “The garden has evolved over time, it speaks to us rather than us speaking to it!” says Lynne. The couple grow seedlings, make hand cream from their own beeswax, and jam from their raspberries and boysenberries. “I tend to prefer being in the back garden, and the bees are my favourite. They produced half a tonne of honey last year and I’ve recently successfully requeened the hives,” says Alan. “In the summer I love sitting out by the hydrangeas, they’re taller than we are in the height of the season and it makes an intimate atmosphere when we’ve got friends round,” says Lynne. On the open garden weekend jams, local honey and afternoon tea will be available for sale. Alan says the garden has been a labour of love, with much work going into improving the soil and creating efficient irrigation through 50,000-litre water systems, including rainwater tanks under the front deck which overflow into a sunken tank. 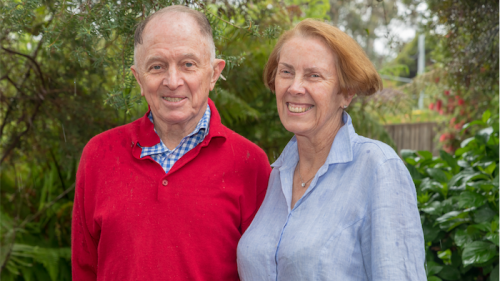 “We’ve done a lot of soil improvement as we started with a lateritic base when we started the garden 35 years ago, and many of the plants I’ve grown myself from seed,” Alan says. 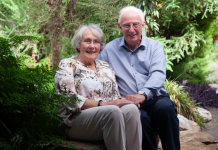 “We built the garden ourselves, we’ve carted in rocks and countless truckloads of soil, washed river sand, built wastewater and rainwater systems, which we top up with mains water. Also open: 2 Larakia Street, Waramanga, a cottage garden with more than 500 bush and climbing roses framed by mature deciduous trees.